Stapleton Fan Club pre-sales will begin Tuesday, January 29 at 10:00am local time. For more information visit www.stapletonfanclub.com. Public tickets for the newly announced concerts begin Friday, February 1 at 10 a.m. local time at livenation.com, Ticketmaster, or by phone 800-745-3000. Live Nation is the official promoter of the All-American Road Show. Citi is the official presale credit card of Chris Stapleton’s “All-American Road Show” tour. As such, Citi cardmembers will have access to purchase presale tickets for U.S. dates beginning Tuesday, January 29 at 10:00am local time until Thursday, January 31 at 10:00pm local time through Citi’s Private Pass Program­­­­­­­­. 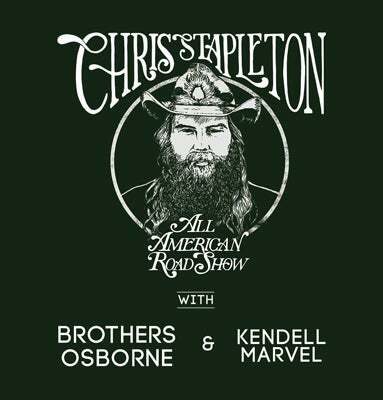 Chris Stapleton with special guest openers Brothers Osborne and Kendell Marvel will play Greensboro Coliseum Saturday, October 19.